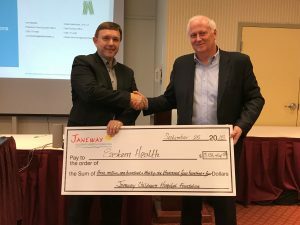 St. John’s, NL – Today the Janeway Children’s Hospital Foundation held its annual general meeting at Holiday Inn in St. John’s. Martin Sullivan, Chair, Janeway Foundation’s Board of Directors, and Lynn Sparkes, President and CEO, Janeway Foundation, shared activities and accomplishments of the fiscal year ended March 31, 2018. One of the larger capital projects being funded by the Foundation is the construction of the Special Care Unit in the surgical ward. This Unit is designed for children who do not require Level 1 critical care, but do require monitoring and close observation following surgery. “In fact, the majority of children’s hospitals across Canada have surgical Special Care Units and we are pleased to announce that the Janeway will enhance the care provided to the children in Newfoundland and Labrador in this way,” Mr. Sullivan said. The Foundation also announced the retiring of three board members and thanked them for their years of service and commitment: Bill Boyd; Bev Evans; and David Norris. Also, the Foundation welcomed new board members: Charlene Johnson, CEO, NOIA; Chris King, Partner, McInnes Cooper; and Krista Ryan, CPA, CA, Senior Manager, PriceWaterHouseCooper. The Janeway Children’s Hospital Foundation is a registered charitable organization created to raise funds to meet the financial needs of the Janeway Children’s Health and Rehabilitation Centre for capital projects, medical equipment and research and programs directly related to the health and welfare of NL children, while promoting awareness of these needs.